An avocado and tomato salsa dip. 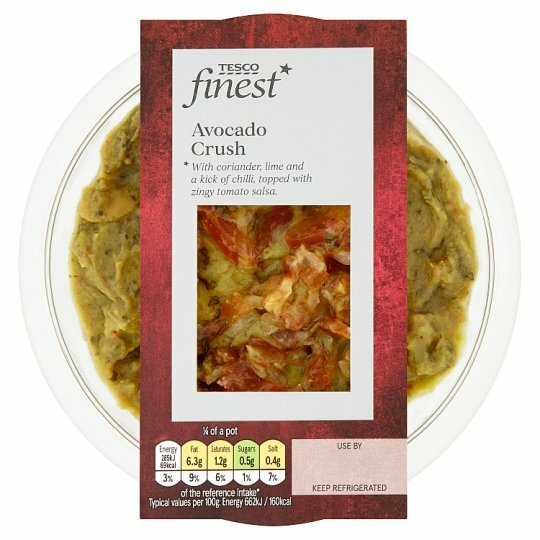 Tesco Finest* Avocado Crush. With coriander, lime and a kick of chilli, topped with zingy tomato salsa. INGREDIENTS: Avocado (76%), Tomato, Lime Juice, Coriander, Rapeseed Oil, Red Chilli, Garlic Purée, Salt, Cornflour, Onion, Concentrated Lime Juice, Antioxidant (Ascorbic Acid), Rice Starch, Stabiliser (Xanthan Gum).